The first time I plunged my masked face into the ocean, I was hooked. 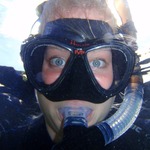 I bobbed upside down as long as I could on one breath, staring corals right in the polyp. I never wanted to look away. I still don't! I've always been passionate about the natural world and our role in protecting and conserving it, so I was naturally drawn to science. I spent my undergraduate years doing wildlife ecology in Michigan, coral community surveys in Mexico, and studying green algae blooms in Washington. Now as a PhD student in Hawaii I am a devoted coral nerd, doing research aimed at practical coral reef conservation applications with the hope that I can make some small contribution towards my grandchildren and great grandchildren being able to stick their own masked faces into coral reefs.